ATHENS – Grady News Now and The Southerner were named the top broadcast and newspaper programs in Georgia, and senior Mary Claire Morris was recognized as the state’s journalist of the year at the 2015 Georgia Scholastic Press Association Awards Ceremony Friday afternoon at the Tate Center at the University of Georgia. The staffs of GNN, The Southerner and Nexus magazine combined to collect 51 individual and staff awards. In addition to Morris’s distinction as the GSPA Georgia Champion Journalist, junior Will Taft was named runner-up in the GSPA Junior Journalist of the Year competition. Of the school’s 38 winners in the individual entry competition, eight were named All-Georgia winners as the best in the state in their respective categories. The All-Georgia winners included Sydney Lord and Angelique Dale (broadcast feature package), Marquise Eppinger (broadcast production), Chase Kleber and Carolyn Capelouto (opposing viewpoints column), Olivia Volkert and Josh Weinstock (sports news story), Conrad Newton (sports column), Madeline Veira (news photograph), Ben Simonds-Malamud (information graphic) and Margo Stockdale, Jennifer Steckl and Carter Guensler (photo illustration). Grady News Now and The Southerner both received the All-Georgia Award, signifying that they are the best programs in the state in their media category. GNN also won the General Excellence Award in the small school category, as did The Southerner in both the newspaper category and the news website category. The General Excellence Award is similar to a state championship in sports because schools win it in competition with other schools in the same size classification. To be eligible for the General Excellenc e Award, each staff had to receive a superior rating from GSPA evaluators. GNN, The Southerner and The Southerner Online received superior ratings. Nexus, the school’s journalistic features magazine, received an excellent rating. Prior to the awards ceremony, the students in attendance were treated to a keynote speech from Samira Jafari, an editor on The Row, CNN‘s editorial oversight team that is responsible for script and story approval for investigative stories across all CNN platforms. Jafari spoke eloquently about the need for journalists to have empathy for their subjects and to remember that the essential task of a good journalist is to uncover the truth when they report stories. 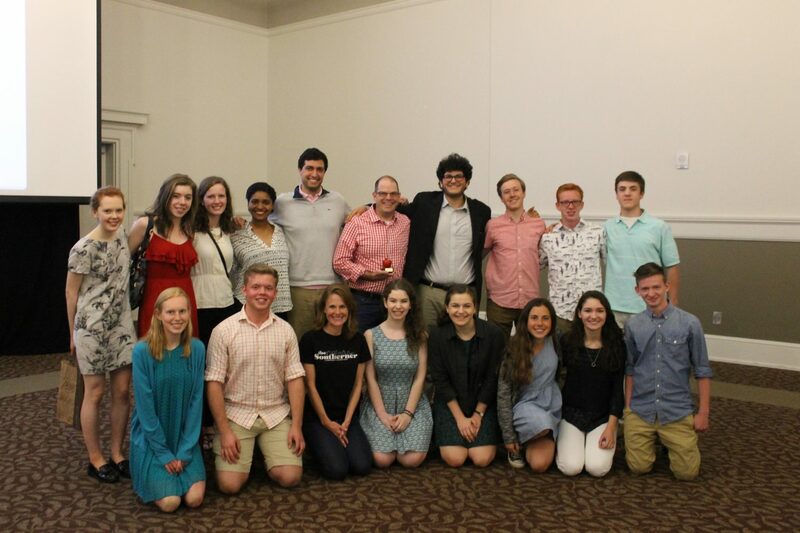 During the ceremony, alums Shaun Kleber (a former Southerner managing editor) and Kate Taber (a former Nexus editor in chief) joined Morris and Simons-Malamud in presenting outgoing adviser Dave Winter with a 2015 GSPA Service Award. The presentation was suggested and organized by former Southerner co-adviser Kate Carter, who joined the current staff and Winter’s wife and two children at this year’s awards ceremony. All of Grady’s winners are listed below.